While not an everyday supper, the Excalibur is sonically filling. Chez Vigier definitely deserves a visit! Neck construction might be a no-no for some, but we’d more than happy to recommend it. Reading back through reviews of these French masterpieces, they’re peppered with words and phrases such as ‘stupidly well built’ and ‘perfection’. And while it’s been a couple of years since we last had our hands on one, nothing has changed in that regard. Actually, that’s not quite right. They’ve got even better. The Excalibur is unbelievably almost 26 years old and is the platform on which the Expert is based. It’s a 24-fret design and that necessitates slightly deeper cutaways along with thinner, less retro-y offset horns. Here we have a thin rosewood slab ’board and HSH Amber pickups - hence the extra ‘a’ at the end of the name (the Supra is DiMarzio-equipped). There are minute details: the over-sanded edges of the headstock; the fact that the strap buttons bolt into threaded metal inserts; even those black scratchplate screws are properly recessed below the face of the plastic. Again, via a Schaller Mega switch, the wiring is a little more complex. The outer positions offer each full humbucker then positions two, three and four all offer singlecoil combinations: bridge (slug coil) and middle; bridge (screw coil) and neck (slug coil); and neck (slug coil) and middle. We’re beginning to believe that the darker the fingerboard looks, then the thinner the neck feels. We had the same perception with the quite darkly tinted all-maple neck on a John Page Classic Special compared with the untinted version, and here the Excalibur neck does feel slim. 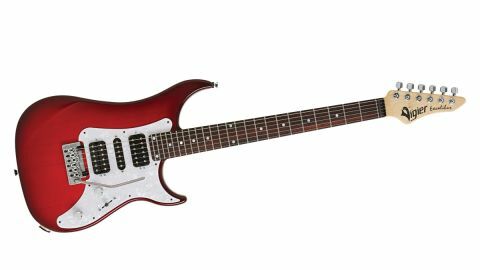 The Excalibur measures 20.02mm at the 1st fret, 23mm at the 12th; however, it feels quite superb with its satin back - what Vigier calls a ‘D’ profile but with trim shoulders that again adds to the perception of being actually slimmer depth’d than it is. Plugging in the Supraa into a clean setup with the neck pickup selected, it’s quite a surprise because you don’t really expect such a vintage-y voice. Compared with a couple of similar guitars, we would prefer just a little more clarity, but this style of pickup can be very genre-hopping and it’s probably not going to be used for your jazz solo set. The mixes pull the level down, with subtlety in terms of the differences - probably due to the close proximity of the voiced coils. For rhythm duties with some rich reverb and modulation, they pretty much all sound superbly ‘super session LA’. A third ‘flavour’, then, is provided by the bridge pickup, which is big, beefy and set to stun, and seems to lap up every gained amp voice we can summon up. Yes, a tapped voicing here would certainly help for those more classic rock sounds, but, as is, the Supraa is not only very versatile, it’s almost like three guitars in one. Ask a group of top chefs to create a classic recipe and each would add their own taste and spice. We might prefer one dish over another; your taste may differ. And then there’s the cost of that dish: it might taste amazing, but it also might be a once-in-a-lifetime supper rather than an everyday experience. Well, super-chef Patrice Vigier can certainly cook. The Excalibur certainly is a more modernistic, virtuoso dish, not least with its sleek look, a punchdrunk bridge pickup and surprisingly vintage-y flavour at the neck with single-coil undercurrents perfectly balanced.